One of my guilty pleasures is cruising Listia for baseball cards. In case you've never heard of it, Listia is an auction site similar to eBay, but you "pay" with points, not money. Points can be earned through surveys, completing tasks, "selling" items or outright purchase using real money. I've put a few items up for auction on Listia, and I've done more than my fair share of surveys, so I've accrued a respectable amount of points without having to put a cent into the Listia business model. However, my main gripe with Listia is there is a lot of garbage to sift through. Finding a card that you're actually interested in can be quite daunting. I may not bid on a card for days on end because of poor selection and outrageous "prices." Which leads to my other problem with Listia, inflation. A point just doesn't go as far as it used to. Auctions used to start in the 1-100 point range and would end in the 250-500 point range. Now auctions usually start at the 499 mark, and end much, much higher. I guess this is due to popularity of the site, but it is aggravating. If any of you are Econ majors, it might make a good paper to study the Listia business model. It some regards it reminds me of a runaway economy in the European Union where the currency has no standard. Alright, alright, enough with the economics drivel, let's look at some cards! Last week, I was able to land three cards of my want lists. One for a set I'm building and two for my HOFer/Superstar project. For the equivalent price of two shirt buttons, a pinch of pocket lint and a random screw, I won this card for my 1987 Donruss set. 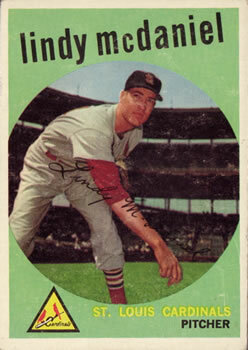 Next on the block, was this snazzy 1959 Lindy McDaniel card. For this one I had to turn to the kid's couch cushions for some extra scratch. I shelled out four cheerios, a piece of congealed milk, six ponytail holders and the lower torso of a GI Joe figure. 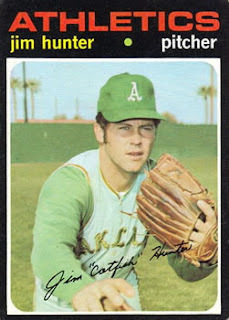 Finally, through patience and my lack of card condition caring (paper-loss on the back of the card, meh), I now own a 1971 Catfish Hunter. I pulled out all the stops on this one, and paid via the household junk drawer. For this lovely card it cost me two AAA batteries, one of those rubber jar opener pads, a pen from my last hotel stay at the Courtyard Hotel and seven, I said seven!, trash bag twisty ties. Not a bad haul for worthless points and free shipping! I've tried Listia a few times (never won anything), but I agree with the inflated credit "price". Starting bid of 499 credits for something I can buy at a card show for 10 cents? No thanks. Congrats on the wins, though. Agreed. Since Listia does have a "buy credits" option, I use that as my basis for card prices. So 499 credits (about a buck 66) for a 2 cent common is horrible rate of return. Even if I didn't pay a sent for the credits except by surveys. Deals are harder and harder to find on Listia. The inflated Credits is the main reason I haven't won too many things there. I have done a couple of surveys so I have gotten more credits than just "hanging out" around there gets. 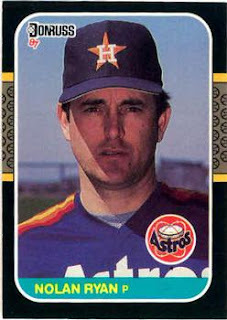 But still it is outrageous when an auction begins around 1,000 credits for some "common" card. I've "won" two cards from there a few months back each one was for less than 100 credits. I'd have to check my records (and probably my blog) for the exact numbers. The first one I had to pay the nominal shipping for the other had free shipping so that one in a sense was "FREE"
I've scaled back on Listia the last couple of months because of credit inflation. I don't like the way things are going there. It was much more enjoyable about 9 months ago. That half of gi joe must've been worth a fortue!